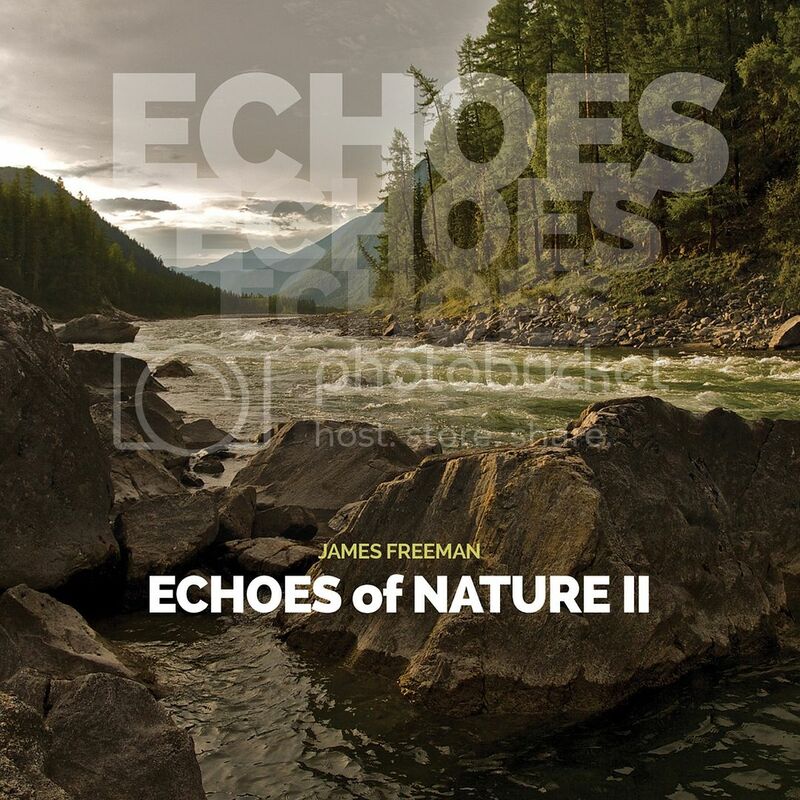 The third installment of James Freeman's "Echoes of Nature" is generally interchangeable with the first two albums, though it is easily the most disjointed, and thus perhaps the most adventurous. Composer, conceptualist, and performer Freeman (synthesizer, bass, and guitar), once again marries his 'field recordings' (equally natural and unpredictable sounds of turkeys, birds, thunder, wolves, etc.) with authoritative soloing by live musicians. In addition to "Echoes" regulars Yehudit and Mad Tolling on violin/viola and Nika Rejto on flute/winds, Sheldon Brown returns on saxophone along with newcomer Lisa Wellhausen on flute. The album begins rather ominously with fragmented low-end flourishes, which sets the tone for the first two tracks 'August Birds' and 'Wolves'. Both tracks, especially 'August Birds', can be surprisingly ominous-sounding. The pair had interesting moments, but more than once I felt like I needed a sonic breath to empty the mind space saturated by Freeman's conceptions. 'Canadian Geese' had more spaciousness and was a very interesting listen. Clean electric guitar comping coupled with the sounds of geese! I digress, but wonder if Canadian Geese sound different then geese of other nationalities? Proficient string improvisation by either Yehudit or Mad Tolling throughout leads to the subsequent 'Thunder Turkeys', which is similar in tonality and the longest track on the album (17:38). The comical, unpredictable sound of turkeys is highly amusing at times, and in this instance Freeman conjoins everything with an electric bass. Again, nearly ten minutes in, I found myself yearning for a long, deep breath as opposed to gasps. I enjoyed the last three tracks the most, notably 'Amazon Dance', which was framed in the 'jazz idiom' and heavy on the winds and reeds. 'Tweety Birds' utilizes Rhodes piano-type sounds panned quickly back-and-forth to great effect. All in all, "Echoes of Nature III" was my least favorite of the bunch, but also the most audacious. It may fare better with a different track order. A remarkable sonic undertaking, regardless. 1. Translate notes into numbers: C= 1, C#=2, etc. 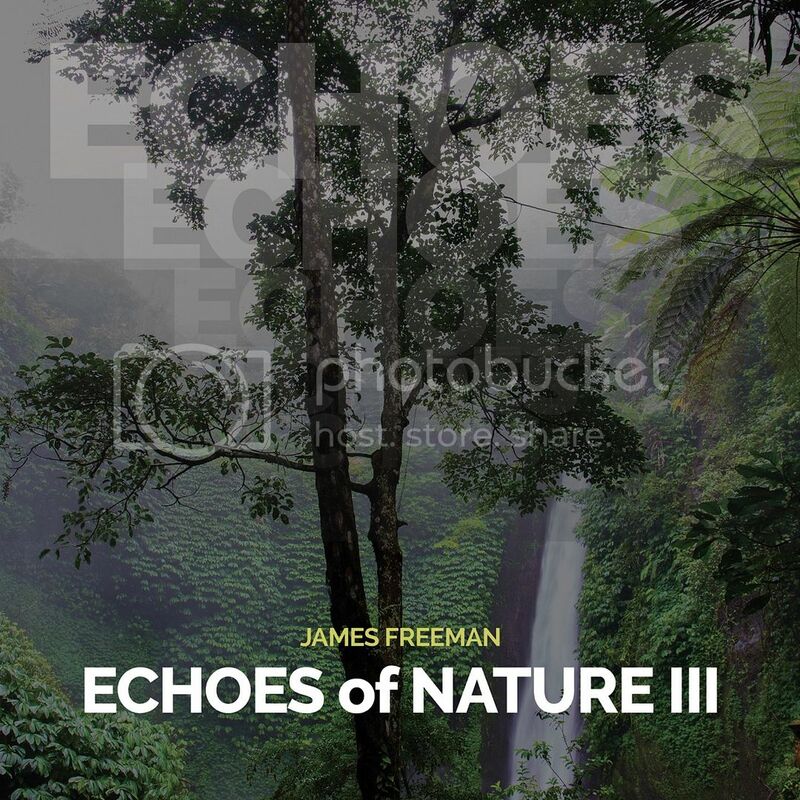 Wait..there's a sequel to James Freeman's "Echoes of Nature"? And - spoiler alert - there's also an "Echoes of Nature III"??!! Still coming to all five senses from listening to the first, along comes a sequel with equally juxtaposed synthetics, natural 'field recordings' (owls, streams, etc. ), and acoustic instruments/live musicians improvising atop it all. The result is surprisingly intriguing yet pastoral. I was impressed with Freeman's first "Echoes of Nature", and this is more of the same, albeit more synthetic-sounding and nimble than the prior. Twenty-minute opener 'Frog Pond' features dexterous synth arpeggios, a frog-like ascending motif that functions almost like a bassline, and animated interplay amongst the soloists ranging in instrumentation from reed to wind to string. Mad Tolling and Yehudit return on violin/viola, as does Nika Rejto on flute and piccolo. In an almost disconcerting way, the inorganic drum that opens the final track 'Jungle Flute' was so synthetic that, for a moment, it took me away from what had been nearly 50 minutes of balanced auditory potpourri. I thought, "that is a very unnatural-sounding drum to imagine either being or hearing in the jungle". 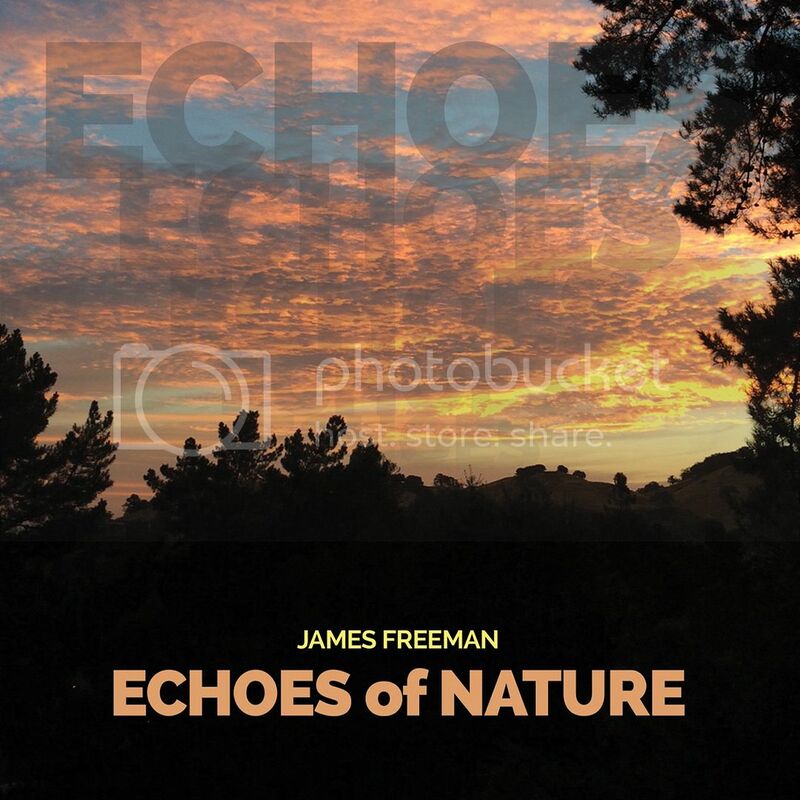 Like everything on both of Freeman's "Echoes of Nature" albums, however, it somehow finds its relative place in the atmosphere, merrily plodding along. Recommended for first-thing AM/last-thing PM listening for maximum enjoyment. James Freeman's "Echoes of Nature" is a curious juxtaposition of synthesis and nature. Pre-listen, my thinking was that - though adventurous - the bulk of the material would be far too labored to have significant merit. The idea of 1s, 0s, and that which is inorganic blended with field recordings of nature (crickets, ocean waves, etc.) further coupled with organic/acoustic instrument improvisation seemed contrived. It still does. But somehow it works, literally filling either a room or your ears with echoes of natural musicality that still somehow derives itself from mathematically-shifting modality. The extended violin and viola soloing of Mad Tolling and Yehudit are out-front but also well-integrated, as-is the flute and piccolo of Nika Rejto on the applicable 'Sunrise Birds'. All of the solos work contextually most of the time, and even when they sound like they might be getting in the way or otherwise too dominant, a temporary reprieve - but hardly a resolution - is almost breath-like as my brain gets ready for the next one. Hard to pick a favorite, but I enjoyed the very long (39:48) 'Morning Waves' the most; it proved to be a dexterous workout for my headphones and my brain. Freeman's slow moving low-end synth swells married with high-end fast arpeggios and scale runs contrast the ocean waves in a spectacular way that is hypnotic. I had the pleasure of listening to "Echoes of Nature" first thing in the early AM, and it was quite rewarding. Musically fulfilling in-the-moment, and somehow continuing to be functional post-listen as I felt a sense of calmness afterward. Ima x Atto Plain is a collaboration of two duos that share one common individual. Ima consists of Nava Dunkelman on percussion and Jeanie-Aprille Tang on electronics and Atto Plain consists of Jeanie-Aprille Tang on electronics and Michael Mersereau on guitar. I was unfamiliar with these projects, but was quite familiar with his work in 15 Degrees Below Zero, which I have enjoyed very much. First off, you have to love a group who has a song title written in Morse Code. We open up with '.- .... . / .-.. . - - . .-. ...' which the Morse Code translator tells me translates to 'ahe letters,' if I have input it correctly. But this is not merely a gimmick; the continual beeps that run over the percussion are reminiscent of Morse Code. Whispered voice, muted trumpet, and chimes / bells become increasingly chaotic, keeping everything interesting. 'Eline' goes for a more expansive and spacey feel, with more bells, drone, and breathy female vocals. This feels almost peaceful after the previous track, with the composition more controlled and purposeful. Very pretty. 'Thin Film' shifts gears once again, with a more sparse, dissonant track that features sheet metal, feedback, and what sounds like distorted harmonica. In the middle, we have some female spoken word mixed in with the noise. 'The Letters' finishes off the disc with clicks, hisses, and metallic whines, as if you were listening to a factory cranking out product. This track was not quite as complex as the others, but still interesting and engaging. Overall, this manages to be all over the map, while maintaining a sense of cohesiveness, which is no small feat. This makes me interested to see what the individual bands sound like, which seems to be a good outcome of any collaboration. "Rodeo" is the work of Chris Golinski (drums), Tim McNalley (bass), and Boaz Roberts (guitar) and consists of five untitled tracks with little information with the disc. The label describes it as 'a study in contrast and extremes, from the visceral to the ephemeral, which resolves to present the listener a seamless flow of five independent yet interrelated works.' For once, the PR copy is accurate. This album flows between moments of incredibly complicated, chaotic improvisation and sparse compositions that are almost too mellow for their own good. Take, for example, the opening track. Imagine the conclusion of a live rock show: wailing guitar, low end drone from the bass, and the drummer going crazy. Now imagine that for several minutes. This was amazing and a lot of fun. The very next track shifts gears immediately. It was almost disarmingly mellow and took forever to fade in. I kept waiting for it to unleash, but it never did. The third track was likewise sparse, getting more complex as it went on. Although they were getting interesting sounds out of their instruments, it didn't really work for me. It was OK, but nothing too amazing. But then were back to the crazy, spastic improve in track 4. The drummer is all over the place and the guitar sounds like he's trying to channel the Emergency Broadcast System, with long tones and a lot of squall. Track 5 closes it on a mellow note. For me this was a mixed bag. When they were on they were really on, and the high energy music is where they excel. However, the other tracks just didn't seem to have the energy of the others. I recognize that energy is not just in your face ' one can have a level of restrained energy in the most sedate tracks, but it just wasn't there for me. Maybe the juxtaposition of extremes was just too much.